The Trump administration has tripled enforcement against employers that hire illegal immigrants, an offense that could involve an array of crimes, the nation’s top immigration official says. “Simple math, more officers in the county jail equals less officers in the community,” @ICEgov Director Thomas Homan says. “We’ve increased worksite enforcement by over 300 percent. 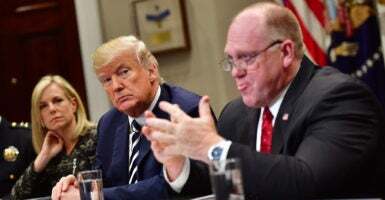 We’re going to continue doing that,” Thomas Homan, who is retiring as chief of Immigration and Customs Enforcement, said Tuesday at the National Press Club in Washington. “We’re not only going to continue conducting criminal investigations of employers where we have evidence of criminal behavior. We’re doing the audits and we are arresting illegal employees,” Homan said. Homan, acting director of ICE because he has not been confirmed by the Senate, is set to retire later this month. As yet, the Trump administration hasn’t chosen a successor, he said at the event sponsored by the Center for Immigration Studies, a pro-enforcement think tank in Washington. Homan spoke in a question-and-answer format with Jessica Vaughan, the organization’s director of policy studies. There is identity theft going on. A lot of these illegal immigrants are using the Social Security numbers of U.S. citizens. There is identity theft. There is tax fraud. There is trafficking. So, there is a criminal aspect to worksite enforcement people don’t understand. Homan responded that he is a native New Yorker and isn’t intimidated by Cuomo. The Justice Department has sued California over a sanctuary state policy that prohibits local law enforcement from assisting federal immigration officials, even by holding illegal immigrants who already are detained in county jails. Homan responded to criticism from California Gov. Jerry Brown, a Democrat, that officials at ICE and other federal agencies aren’t telling the truth. Homan said California law enforcement authorities oppose Senate Bill 54, the sanctuary state law. If local law enforcement cooperates, he said, then ICE agents won’t need to look for criminal immigrants in the community. Simple math: More officers in the county jail equals less officers in the community. That’s just operational reality. … Don’t tell me to prioritize criminals, but you can’t come to my county jail. It doesn’t make sense. The ICE chief praised President Donald Trump for doing more than any of the other five presidents he worked for to protect public safety. 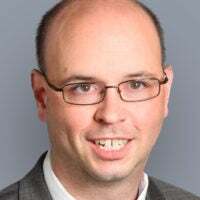 But he expressed skepticism about the president’s willingness to make a deal with Congress on the policy known as Deferred Action for Childhood Arrivals, which the Obama administration imposed by executive action. DACA, which Trump announced he will end, allows certain illegal immigrants who were brought here illegally as children to be shielded from deportation and to obtain work permits. Although Trump and Congress failed to reach a deal on legislating a version of policy, the president has said he is willing to support amnesty for those so-called “Dreamers” in exchange for increased enforcement, such as a border wall, and a merit-based immigration system. He added that the United States must seek to stop illegal immigration first. You’ve got to address that as part of the fix. Because if you don’t, those families coming across now will be your next DACA in 10 years. Let’s stop kicking that can down the road. If you want to do a fix on DACA, let’s talk about an overarching issue of illegal immigration, so we don’t have a DACA every 10 years. We don’t have an amnesty every 15 to 20 years. Let’s fix it. As he prepares to exit the agency, Homan also strongly defended his agents against political attacks and name-calling. “A lot of people want to attack ICE. I see it every day. They want to call ICE racist. They want to call us Nazis,” Homan said.